George Graham reviews Steve Hauschildt's "Dissolvi"
In the midst of computer-generated electronic pop on the one hand and grungy indie bands on the other, the contemporary music scene also takes some interesting side roads. There is a fair amount of retro of various types, but there is also a kind of contemporary folk sound around, with acoustic artists and bands who are going for the more traditional sounds like bluegrass. This week, we have the latest album by another group from one of those sort of indie folk projects, Great Lake Swimmers, whose new release is called The Waves, The Wake. Great Lake Swimmers, based in Toronto, Canada, are marking their 15th year as an ongoing musical project, though on this album, it’s less of band than a collection of creatively arranged songs by the singer-songwriter Tony Dekker. Great Lake Swimmers has long been known in Canada as a folk-rock band, doing acoustic-guitar dominated music with the literate lyrics of a the folkies. They have been touring regularly and releasing a series of albums and EPs, and contributing music to film soundtracks. The Waves, The Wake, is their seventh full-length release. Dekker explained that this album was an effort to try something different, using almost no acoustic guitar, instead relying an eclectic set of instrumentation that varies from track to track, including cello, violin, marimba, woodwind instruments, and even some church organ. There is also an a cappella track. The album was primarily recorded in an old church in London, Ontario, whose acoustics became part of The Wave, The Wake’s atmospheric sound. The result is an album that has a pleasingly mellow texture, but with a lot of interesting details. Tony Dekker’s high tenor vocals are a nice fit the music, or perhaps the instrumentation was arranged to work around Dekker’s voice. His lyrics are poetic in a folkie singer-songwriter sort of way, ranging from a kind of hope for a better world, to a few love songs, to some general ruminations. Among the players on the album are Kevin Kane from the long-running Canadian band The Grapes of Wrath, and people who have performed over the years with Great Lake Swimmers, Erik Arnesen on banjo and some guitar, Bret Higgins on acoustic bass, and Jacob VanTassle on percussion, including some marimba. The Waves, The Wake, the new album by the long-running Canadian folk-rock group Great Lake Swimmers, marks a something of a departure from the band’s acoustic-guitar dominated sound. The eclectic arrangements bring in various orchestral instruments in an atmospheric setting for the lyrics which also tend to be more introspective. Though singer-songwriter Tony Dekker has been at the core of this group, the new album is essentially a Dekker solo album, with all the other personnel varying from one track to the other. He comes up with an intelligent and pleasing bunch of songs that you can easily get lost in. We’ll give the album about an A-minus for sound quality. The old church in which the album was recorded provides some of the atmospheric sound that marks the album, though sometimes it can get a little murky with some of the instrumental textures lost in the wash. There are also a couple instances of distortion from digital overloading. But overall, the sound fits the mood of the music. 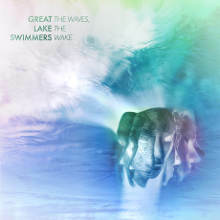 The album’s title The Waves, The Wake, is explained on the band’s website as a metaphor for the “the future ahead and the past trailing behind.” For those who may be new to Great Lakes Swimmers, this album may not be typical of their past work, but it’s a great way to become acquainted with this first rate musical endeavor from north of the border.